The YaaS marketplace offers a lot of cool packages and services that are prebuilt and can be plugged right in to your application. YaaS also allows you to test out the service through their documentation. In the API console within the API Docs portion of the Dev Portal, you can see the documentation and test the available services in the package. With the Port of Antwerp hackathon this weekend, a new Beta service called the Earth Observation Analysis service is being highlighted. Check out the Earth Observation Analysis primer and Port of Antwerp with EOA blogs to see how to get started with YaaS and the EOA microservice. But once you have done the testing on the Dev Portal and in your local bash, how do you get the service into your HCP hosted application? YaaS microservices can be treated just like any the API. In HCP, go to your Destinations and create a New Destination. The service URL is available in the API Docs for the service on the YaaS Dev Portal. 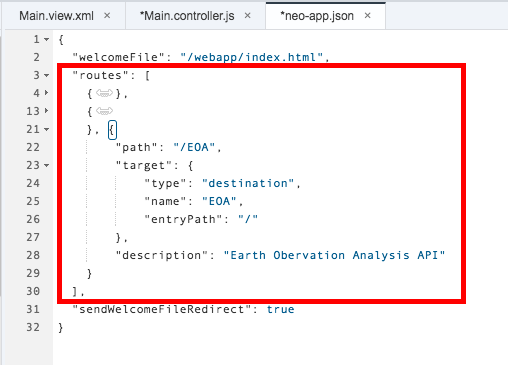 For the Earth Observation Analysis microservice, authentication will be provided as part of the header parameter in your AJAX call, so for the destination, you can select “NoAuthentication” as the Authentication option. Save your destination and now your YaaS microservice is available to use in HCP! Now the service URL will be available in your controller via the path described in the neo-app file. Add an AJAX call to your controller and you’re connected to your API! NOTE: This is a BETA service and the only available response format is XML. A JSON format is on the roadmap for next year. Want to learn more about APIs in UI5? Check out my blog series starting with Creating a Destination. Try it out with any of the APIs available on YaaS, such as the Earth Observation Analysis! Hi Meredith, thanks for the blog. Tried this out in my trial HCP but whenever I call the getCoverage API the browser crashes due to the size of the images being returned. Tried in Chrome and IE11. Have you come across this issue or have you any suggestions to work around? Hi Flavio, no haven’t looked at it much since however I did see this blog by Robert Russell – he has a section on how to download the images – https://blogs.sap.com/2016/12/23/further-adventures-with-sql-anywhere-developer-edition-using-ui5-odata-xs-hcp-node.js-and-the-yaas-earth-observation-service/.